Come and learn from Rita Fishel how you can use the Creative Grid Rulers that you own or hope to own in creating your own quilts. A fellow member saw Rita demonstate last year and recommended her to us. Rita Fishel is a nationally known author, speaker, and teacher. She is Goddess and Queen Mother of Creations SewClever in Chillicothe, Ohio, and national Demo-Goddess, designer, and consultant for Creative Grids USA. 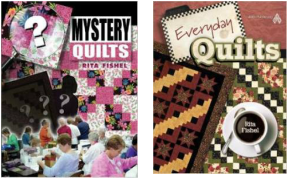 She is the author of two books from the American Quilter’s Society: Mystery Quilts and Everyday Quilts. ​A native of northeastern Ohio with a B.A. in clothing and textiles/business from the University of Akron, Rita purchased a small clothing and fabric business in 1992 and hasn’t looked back. Now located in a beautiful 1800s Georgian home, Creations SewClever is a full-line quilt shop with three longarm quilting machines, a friendly staff of 16 quilters, and an amusing resident ghost. When she’s not there, Rita is on the road in the Stitch Mobile, sharing her passion for all-things-quilt with guilds and groups nationwide. For more information, visit Creations SewClever online at www.creationssewclever.com. © COPYRIGHT 2016 RIVERWALK QUILTERS GUILD ALL RIGHTS RESERVED.